Presenting Sword and Verse #1 Sword and Verse by Kathy McMillan. A gorgeous cover. A resoundingly interesting synopsis. A fabulously constructed world with its own quirks and quips. And two rather trusting characters in the royal Prince Mati and his forbidden love, the slave and tutor-in-training Raisa. 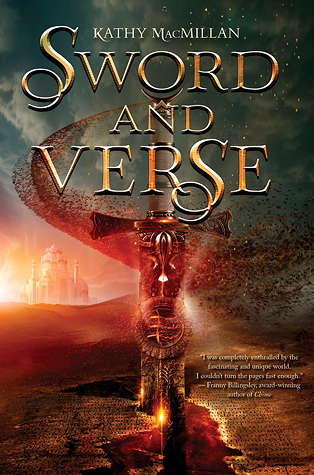 Conspiracies and treacheries notwithstanding Kathy McMillan's Sword and Verse proves to be an enlightening experience with some serious drawback that prevented me from enjoying the tale to the fullest and it getting 2 stars less from me. Raisa and Mati. Romance between the royalty and the servant is not really new, literature is littered with several others like our pair here. All things excluded while there's is not an insta-love by any chance it's rather a hard bit to swallow because really their romance doesn't seem believable at all. Its like they were put there because the situation warranted it to be ...... Of course the one thing that did shone through was just how much they trusted each other. Raisa didn't seem like the bonafide heroine here. Which I kinda about her. Of course I liked her better when she wasn't mooning over Mati and making irritating decisions that could cost her her life. Complaisant at best, she also doesn't seem at all interested in the revolution at first. Definitely liked that she didn't just go down that path just because she was pressured into it instead chose to blaze her own trail. Mati on the other hand, while possessing some very reliable and admirable qualities lacked a backbone to stand for himself. Although he comes to his senses soon and realizes the throne isn't always everything. Didn't really like how he uses and then discards her to come groveling back. He was Ok ..... no both Raisa and he are an ok pair really ..... they don't win points with me but they seem complacent enough. McMillan presents us with a wonderful world but she tries to do too much here. While I liked the writing system depicted and almost gave the tale an exotic and vibrant feel ..... but I found my attention wandering a lot. The pacing also was very slow. Pretty much drags through the first half and then suddenly picks up at supersonic speed and barrels through to the end. While the world building was marvelously done, i just couldn't connect with the characters at all. Also the story pretty much ends in the book but Goodreads shows that this is a series. Wonder what happens next because the author could have easily divided the first book into a series, that would definitely have been a better prospect than what we are getting here. Not really keen on this book but I would totally recommend that you all give it a try and maybe you'll find something I didn't here. "A nicely written plot but an average adventure"
I've seen a lot of the same reviews for this one, so sad it wasn't a better read. The cover would have reeled me in a few years ago, but I've learned. Your review has confirmed what I already thought when I read the synopsis of this one...nothing new. In fact, it sounds like something I've already read. Red Queen, maybe? Or a combination of some? Good review.